Common brittle stars Ophiothrix fragilis, copyright Bernard Picton. 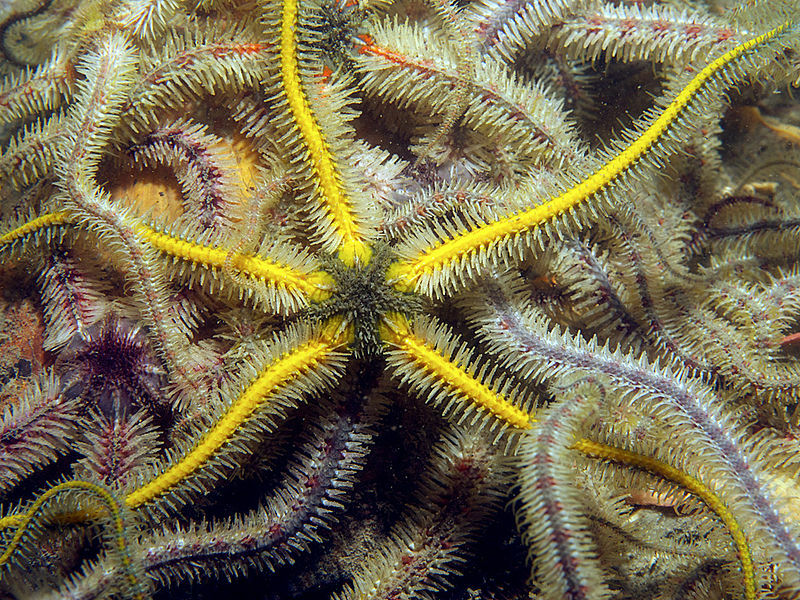 The Ophiotrichidae are a family of stout-toothed brittle stars. Characters (from Spencer & Wright 1966): Teeth stout, quadrangular, spiniform tooth papillae clustered at apex of each jaw. No oral papillae. [AB01] Aronson, R. B., & D. B. Blake. 2001. Global climate change and the origin of modern benthic communities in Antarctica. American Zoologist 41: 27–39. [BK77] Barel, C. D. N., & P. G. N. Kramers. 1977. A survey of the echinoderm associates of the north-east Atlantic area. Zoologische Verhandelingen 156: 1–159. [B01] Boczarowski, A. 2001. Isolated sclerites of Devonian non-pelmatozoan echinoderms. Palaeontologia Polonica 59: 1–219. [BM09] Bryce, C., & L. Marsh. 2009. Echinodermata (Asteroidea, Echinoidea and Holothuroidea) of Mermaid (Rowley Shoals), Scott and Seringapatam Reefs, Western Australia. Records of the Western Australian Museum Supplement 77: 209–220. [CH97] Castro, P., & M. E. Huber. 1997. Marine Biology 2nd ed. WCB McGraw-Hill: Boston. [F67] Fell, H. B. 1967. Echinoderm ontogeny. In: Moore, R. C. (ed.) Treatise on Invertebrate Paleontology pt S. Echinodermata 1. General characters. Homalozoa—Crinozoa (except Crinoidea) vol. 1 pp. S60–S85. The Geological Society of America, Inc., and The University of Kansas: Lawrence (Kansas). [SW66] Spencer, W. K., & C. W. Wright. 1966. Asterozoans. In: Moore, R. C. (ed.) Treatise on invertebrate Paleontology pt U. Echinodermata 3 vol. 1 pp. U4–U107. The Geological Society of America, Inc., and The University of Kansas Press.